Everything is getting advanced every day by day. The world of Technology is always on the verge of making everything simpler and possible to use, without the discoveries being complicated for people to use. Already mobile tech is really going a long way in dominating the technological scene. You could remember when laptops were coming out newly, they were replacing bulky desktop. And as it stands now, smart phones, tablets etc are just replacing those bulky machines too. Android operating system is one of the most popular in mobile OS used by many. Are you such looking for how to run your apps on your PC/laptops, here comes the very Article for that. Just follow the very steps provided below and your android apps would run on your computer. The very first thing you need to do is to download an app called Android Emulator on your computer. You can download it from the below provided link. Using Android emulator on your computer, you can be able to use any Android apps on it without any restriction. Note there are several Android emulators available, some are free but some are tagged with price. But am recommending one of the best among all android emulators to you, which is "Bluestack" The app works like magic, It goes a along way in transforming your computer into tablets, by running any android app you like on your PC. Note: When installing the app you downloaded above, make sure you tick on "App store access" so that you can easily download any choice of android app you want on Google play store. Just sign in with your Google account, and you are good to go friend. How To Control Your Android Device From Your Computer. The very app you can use to make this happen is known as "AirDroid" with AirDroid installed on your PC, you can remote and control your mobile device in sharing of files like videos, music, photos and any documents. So with AirDroid, easy sharing of files on both mobile phone and PC is very common. That is to say, this app is a must have for all that requires to easily control their mobile device through PC. The app is free for all to use. 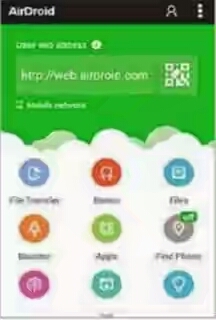 To Dowonload AirDroid Click Here. Although I have written post about this. but there is a need of writing it again. So for those coming across this post for the first time, the post is all about setting up your whatsapp to work on your computers.This means, you can chat your friends on whatsapp via your PC. 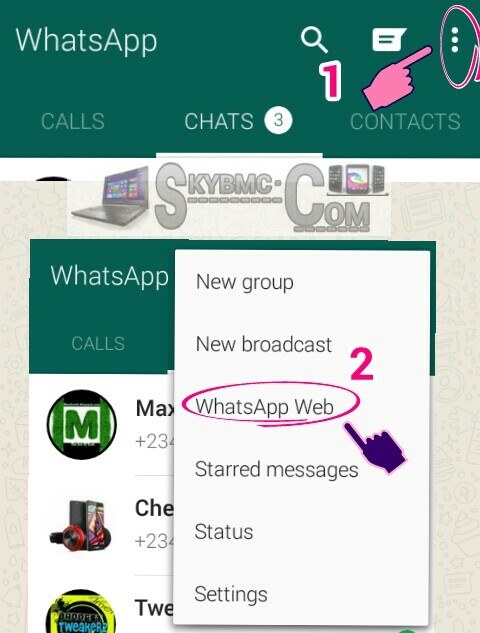 Whatsapp launched the web version for users, so you can chat using your PC with the following steps provided below to set it up. It works in this manner, if you scan the QR code with your phone, then next, you goto whatsapp web by clicking on the three dot icon you see, which can be located at the top right corner. See above image for that. Now, let's assume you are on the web after clicking on "whatsapp web" via your smart phone. Next, is to scan the QR code again on the web in order to synchronize your phone's WhatsApp account with that of whatsapp web account. Now wait for some few minutes, then whatsapp will reload on the browser you are using. Bravo, after the web whatsapp reloading, you are ready to use whatsapp on any browser using your computer. To avoid missing most of your important calls and SMS, then you need this app called "Spots" The app Spots is an amazing chrome extension software that solves the aforementioned issue related to Miss calls and SMS, Just by hooking up your smart phone with browsers so as to enable you check your call records and missed calls on web browsers. It also give users the forum to reply to messages and as well, search for contacts on notification for calls and SMS. All these you can do without going close to your phone. That is what Spots app can do when you install it. After downloading, you are required to install spots magical launcher so as to enable you to use the handy spots chrome extension and also sign in with your Google account after installation. That's all, enjoy.